These New Clear View Lockers - 2 Tier are available on www.buyusedlockers.com where they have a huge selection to choose from if we need additional supplies. New Clear Lockers IN STOCK. Each compartment is 36" high making the height of the 2 tier lockers 78" with 6" legs (84" total height). The legs can be removed for a nominal fee. 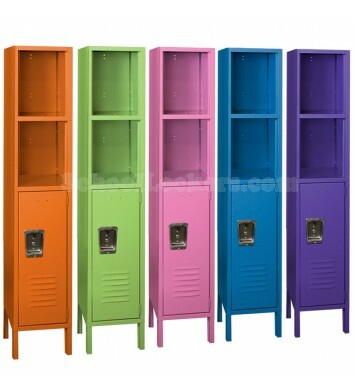 These are also available in up to 30 color choices with unlimited sizes as production lockers. Clear lockers have panels made of durable, high strength injection molded polycarbonate in the doors which allows visual inspection of the contents (hence the name "clear view lockers"). Hinges on these lockers are continuous piano hinges to provide stability and 16 gauge reinforced welded channel framed doors and the doors accept multiple locker lock options. Ideal users for these clear lockers include employees, office staff, club attendees, gym members, locker rooms, pool lockers, etc.